We decided to go on a scenic road trip to Mt Dandenong. Perfect weather for it! We went around the winding roads and found ourselves at Miss Marples, which is a gorgeous cottage style teahouse. 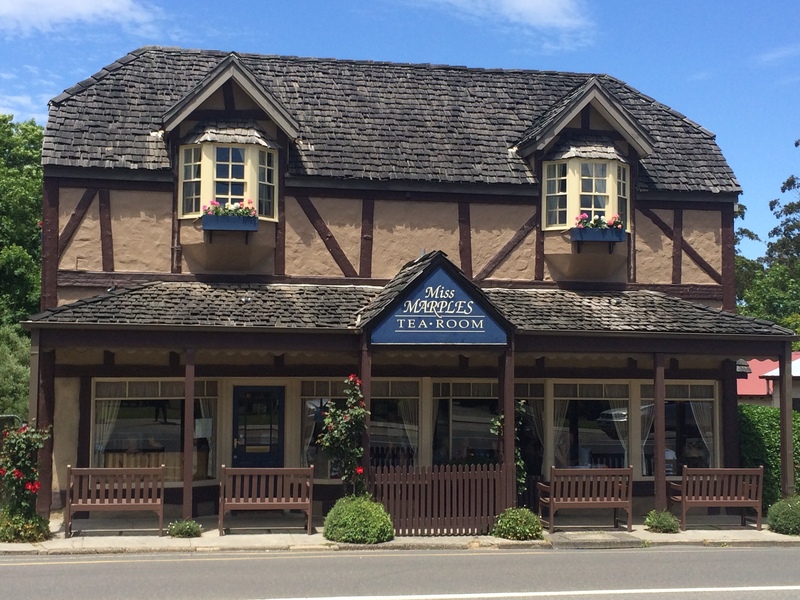 The floral tablecloths, framed black and white photos on the wall, shelved teapots, traditional English lamps, fireplace and 1930’s music playing in the background made you feel like you were taking a step back in time. Miss Marple’s are well known for their Devonshire scones. Scones and tea is a match made in heaven. 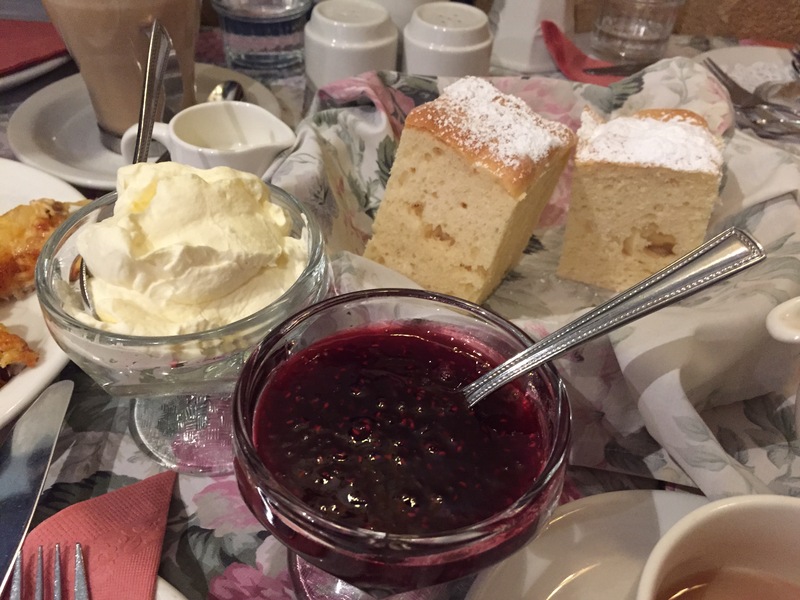 The scones were yummy on their own but with a liberal layer of Miss Marple’s homemade raspberry jam and lashings of freshly whipped cream it was heavenly. You can choose the plain scones or the fruit scones or one of each if you can’t decide. They look like tall squares of scone, which are light and fluffy. Gone are the days when each scone was baked individually. They now make a whole tray of scone and cut them into squares. Which is fine by me because they still taste great. 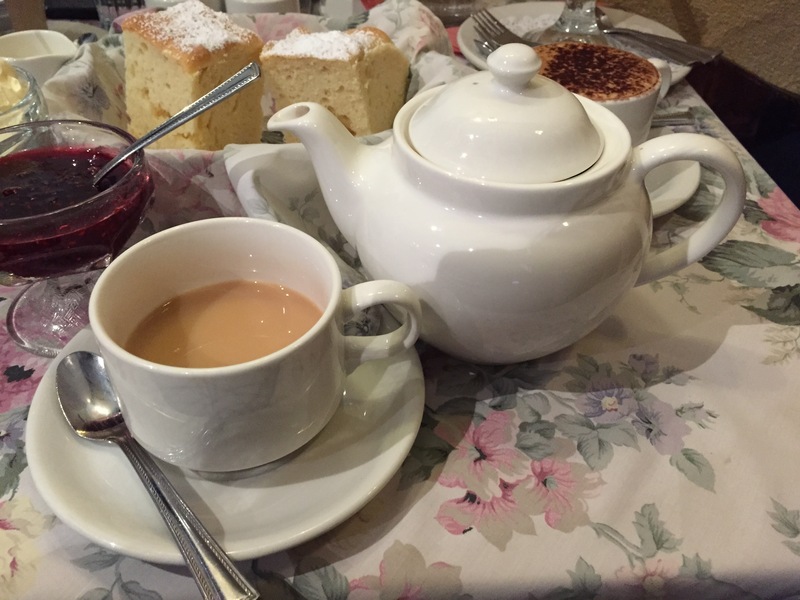 The tea was Miss Marple’s own house blend called “Yorkshire Gold,” which was voted ‘best cup of tea in England’ by the British tea council. And it was pretty amazing and yep it went perfectly with my jam and cream scone too. We got Miss Marple’s Famous Fingers, which are little open tea sandwiches with different toppings. We got chicken, cheese & pineapple fingers which were delish. 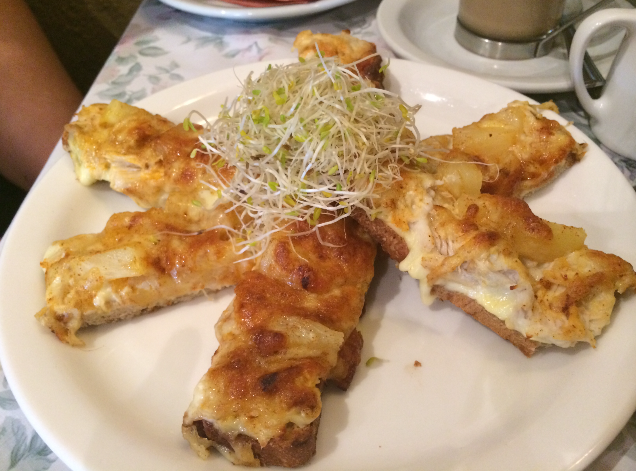 It had a generous amount of shredded chicken on each piece, with creamy mayo, topped with grilled cheese and pineapple. Garnished with some alfalfa sprouts. Yum! The home-style cottage pie is nice and comforting. They have a chicken or beef version. We got the beef cottage pie, which was yummy. It tasted like a homemade cottage pie. 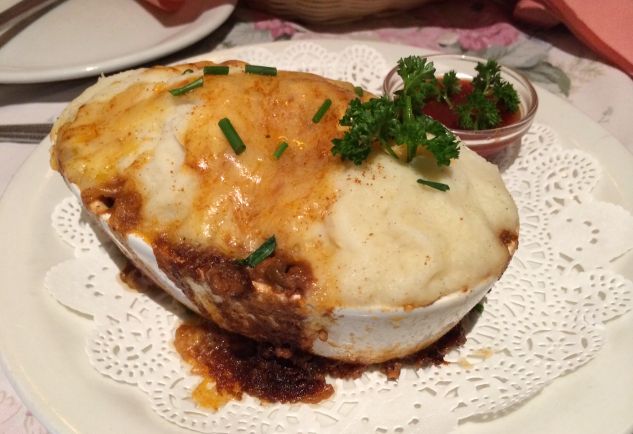 The hearty beef mince meat and veg topped with fluffy potato was baked in a mini ceramic casserole dish. And it was served with tomato sauce (didn’t even have to ask). 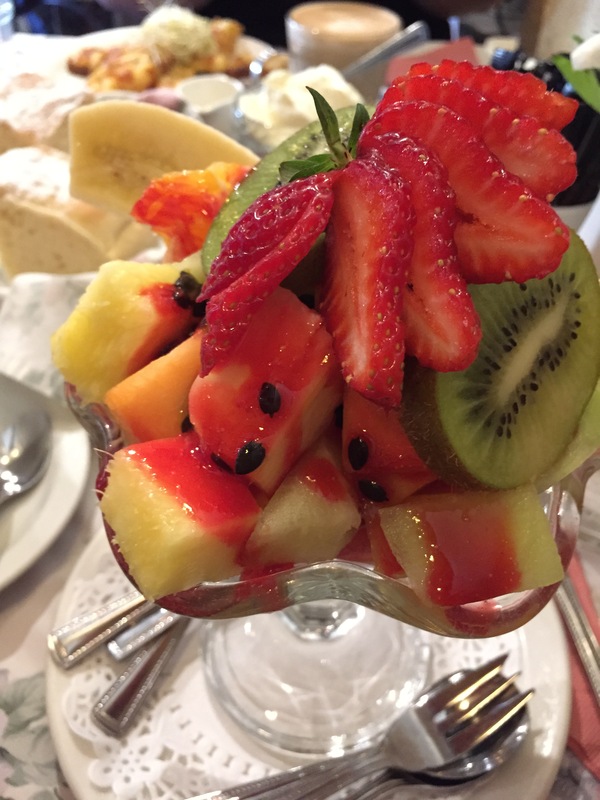 My friend got the fruit salad, which was like a healthy version of a sundae, which you can get with cream or ice cream. It was fresh and colourful, and fruity of course. 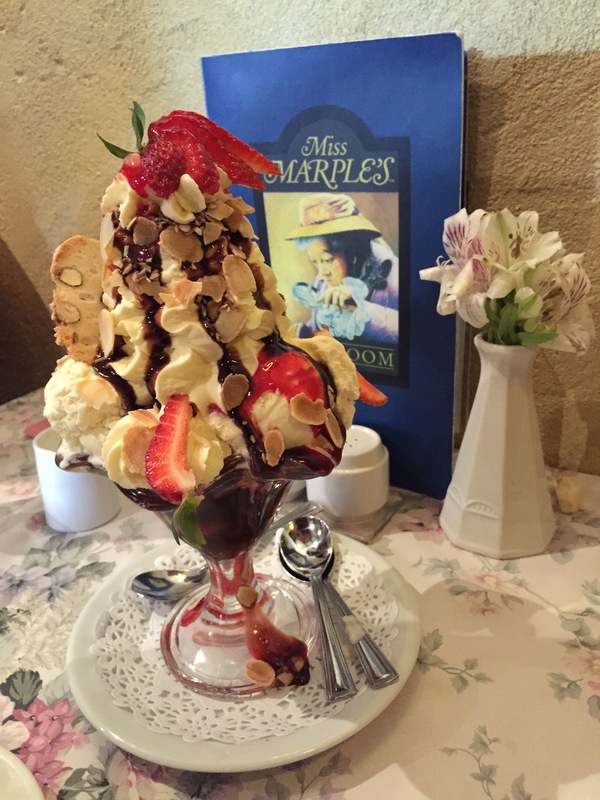 We got Miss Marples “sundae best.” When the sundae came out, our jaws dropped. Oh my. The sundae was mammoth! It’s what a sundae looks like in movies, in cartoons, in my dreams. It was amazing! Masses of vanilla ice-cream and whipped cream topped with chocolate fudge and fresh berry sauce, then sprinkled with roasted flaked almonds and two thin pieces of almond biscotti. I shared it with a friend but the feat was insurmountable. We tried to eat the whole thing but were sadly defeated. It was too massive for the two of us. However it is not unachievable, my friend’s dad can eat the whole sundae on his own even after eating Miss Marple’s fish and chips. Now that is impressive. 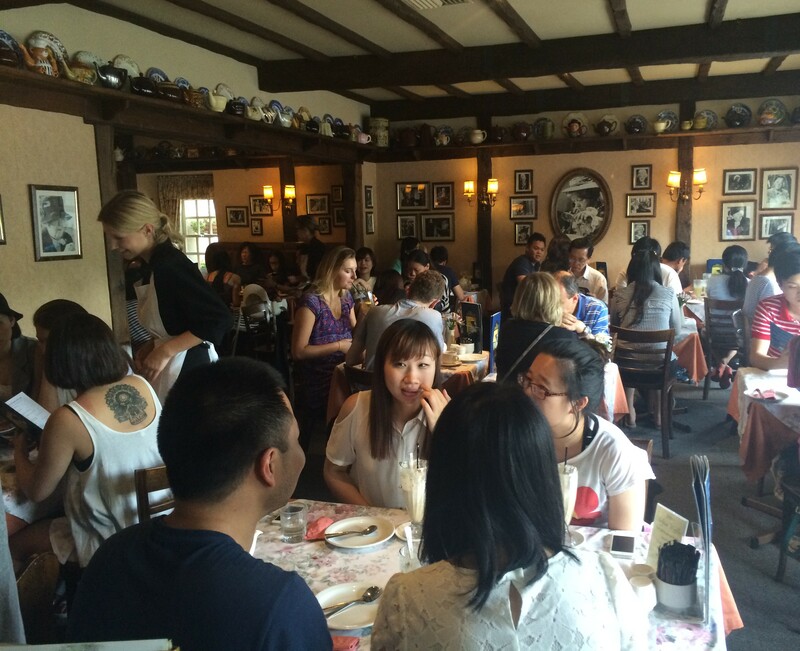 It’s very popular and often packed so you might have to wait a little while to be seated. But it’s fine because it gives you time to browse the little shops in the area. The staff are really lovely and make you feel at home. I assured our waitress we would finish our sundae but it was one of those ‘eyes too big for your stomach’ moments. Ah wells. Maybe next time. I heart Miss Marples Tea-room! 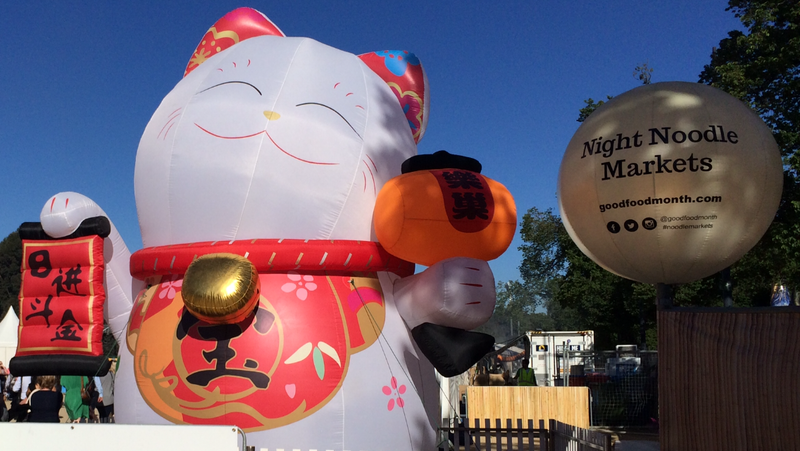 The return of the night noodle market makes me happy. 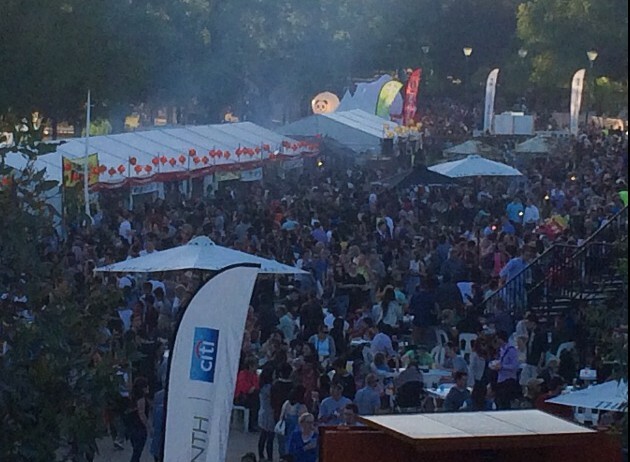 Last year it was a major hit and this year its back with double the food stalls. 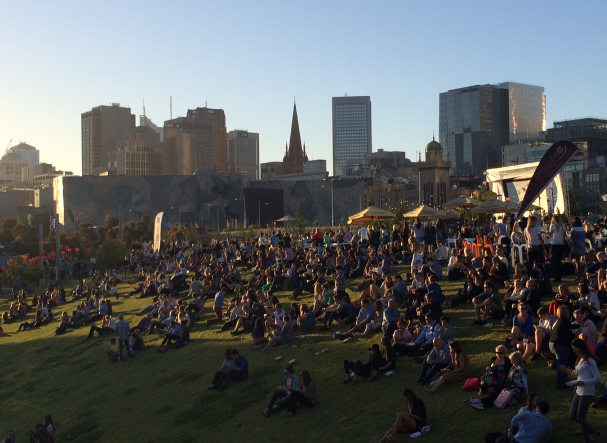 This time it’s held at a different, and much larger venue, Birrarung Marr. Which is a great idea considering last year the event was packed to the max. 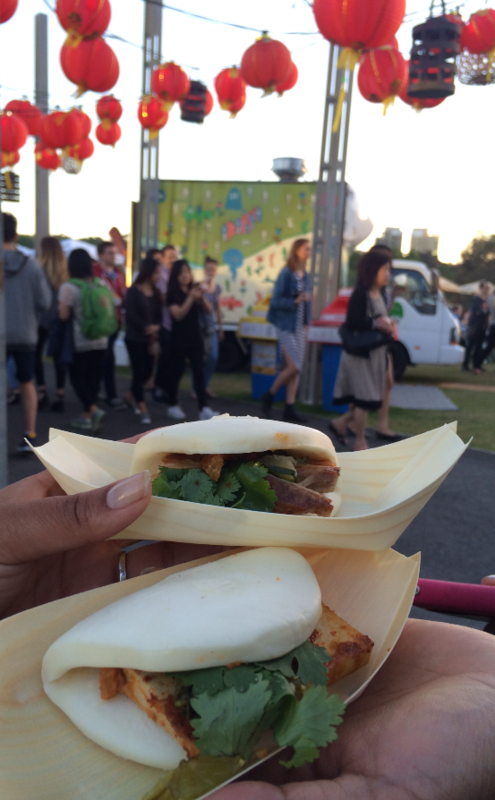 The noodle night markets present a collection of authentic Asian cuisines and Asian inspired dishes from across the continent. I generally like to go earlier because there are less people, less queues and more available seats…winning! It’s a really popular event so one minute there is no queue, the next minute there is a really long queue. As they say, the early bird gets the noodle. They was a big grassy knoll, which is perfect for good weather you can have a little picnic on the hill. The weather was all sunshine so a tropical dessert from Red Spice Road sounded like a good starter. 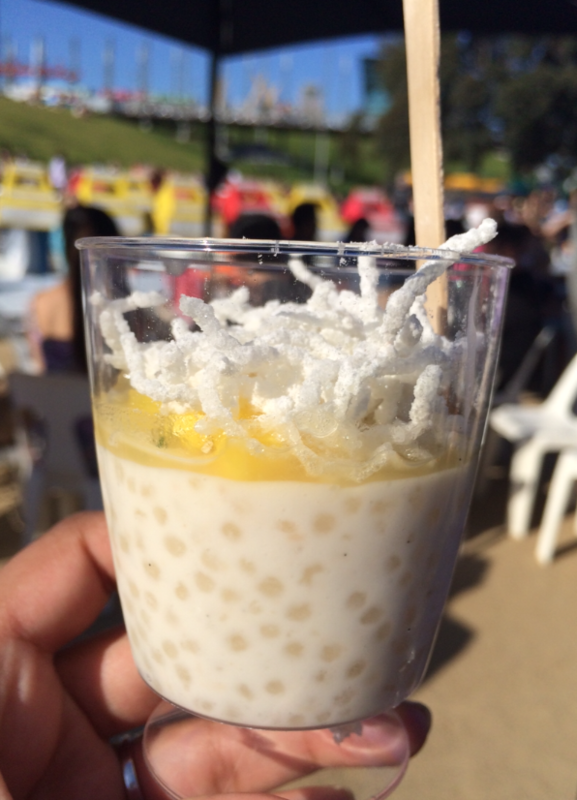 We had a coconut sago pudding w pineapple & lime. It was really fresh and had lots of different textural elements. 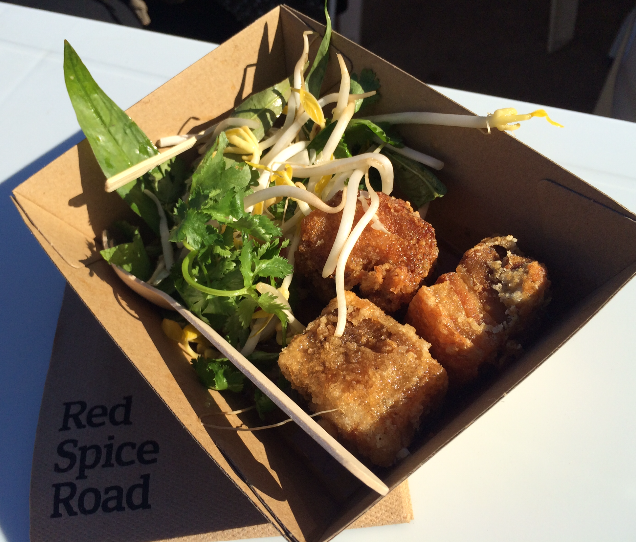 We also got a savoury dish from Red Spice Road. The five spice pork belly w chilli caramel. It was delicious! The pork belly was deep-fried, crispy on the outside and soft and sticky in the middle. The chilli caramel was so good with the pork and it was complimented with a side of fresh beans shoots, coriander and mint. Yum! 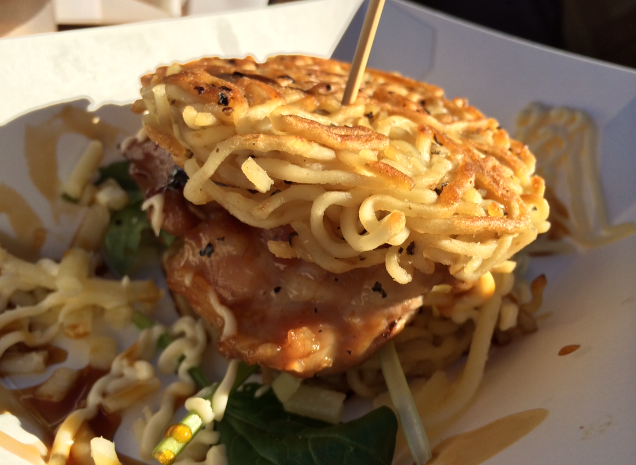 From Ramen Burger we got the…wait for it…yep, the ramen burger. We ordered the chicken one, which was well constructed and tasted good. It was a fillet of teriyaki chicken amongst two noodle patties with some spinach, cheese and mayo. And yes the burger bun was made entirely out of thin egg noodles, which were toasted, so they had a bit of a crispy noodle crunch. It was good. 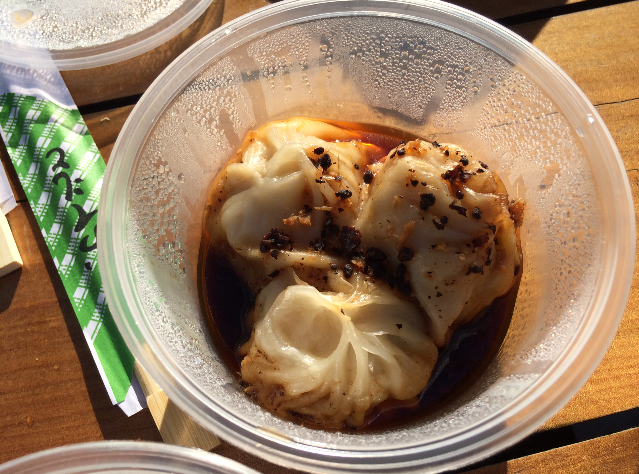 From Charlie’s Dumplings we tried the steamed pork and ginger dumplings with black bean and chilli dressing. They were yum. The pastry was good and the filling melted in your mouth. The dressing was nice and had a good chilli kick. Also from Charlie’s dumplings we got the Milk chocolate dumplings w raspberry and chilli sauce. Luckily the guy at the store gave us a heads up on how to eat the dumplings in daylight (as chocolate is less visible after dark). We ate the dumplings whole as suggested to avoid a chocolate mishap. They were yum and our shirts got through unscathed. 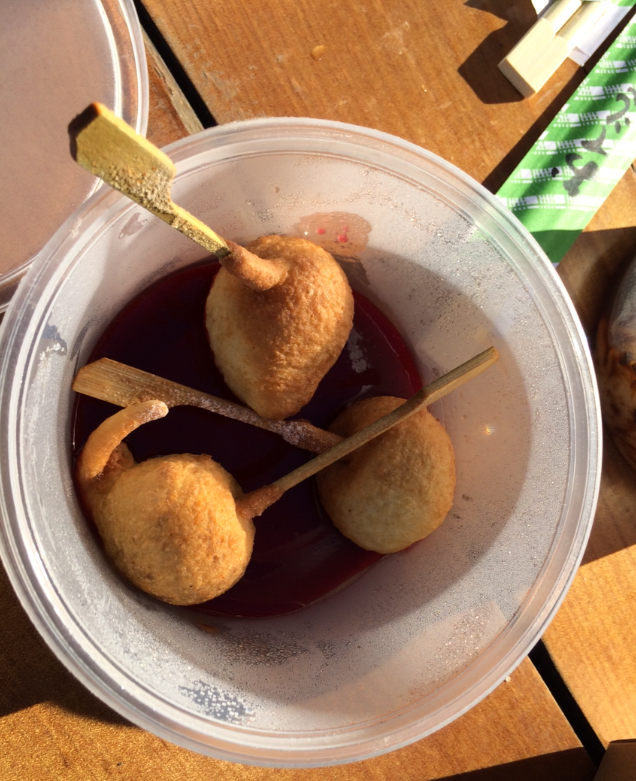 The dumplings were battered balls of chocolate. A great idea. They were sitting in the raspberry and chilli sauce, which was nice. The taste of chilli was barely noticeable which I liked. 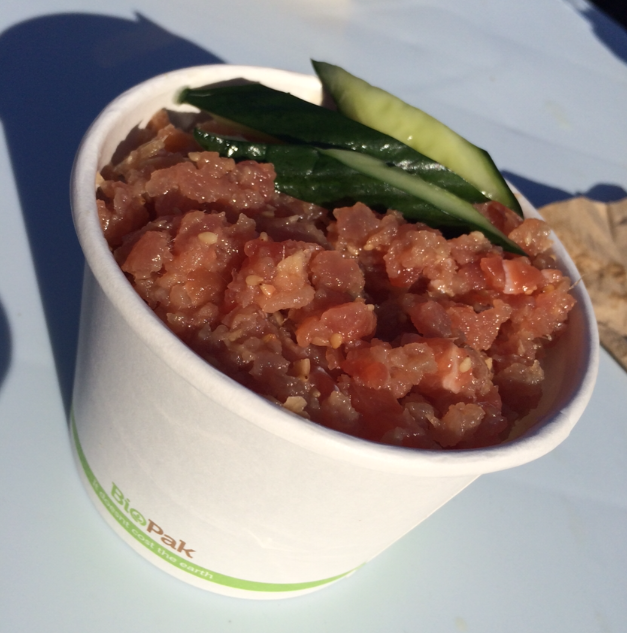 We tried the Nakaochi from Izakaya Den, which is a tuna and salmon tartare w sesame & ginger. It was served with some salted cucumber and steamed rice. I really liked it. It was fresh and the oily fish went well with the steamed rice. It was really yum. 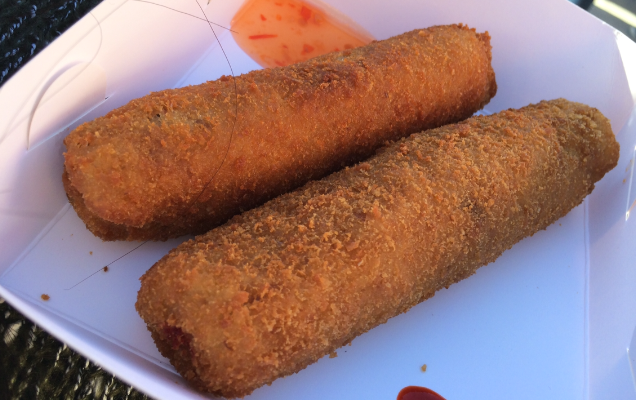 We got a couple of veg pan rolls from the Lankan Tucker stall. They were nice with some sweet chilli dipping sauce. The soft shell crab burger was incredible. I didn’t realise I was such a fan of soft-shell crab. This burger was amazing. 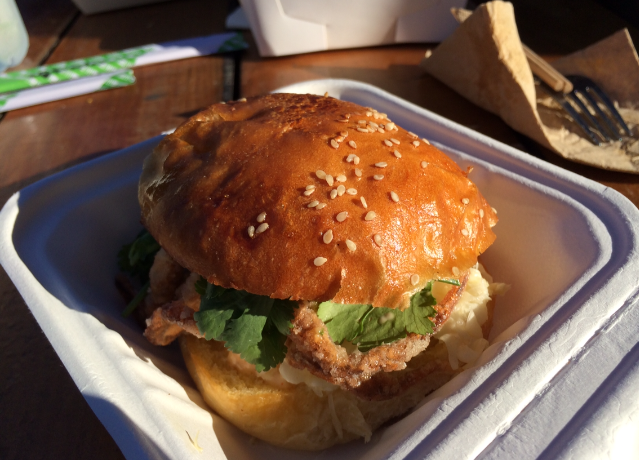 It was a crispy fried soft-shell crab in a soft buttery brioche bun with cabbage and sriracha mayo. Oh my goodness. It took me to a heavenly place. Loved it. At this point we were getting very full and decided we would get bun one and bun two from Kong. B1 was spicy pork belly, pickled cucumber & crazy horse sauce and B2 was peanut butter S&P tofu w burnt chilli mayo. They were good. I was petting the buns they were so soft. There was a long order line and an even longer collect line. So you could maybe have one person in each line and while the first person orders, the second person is already in queue to collect the order. 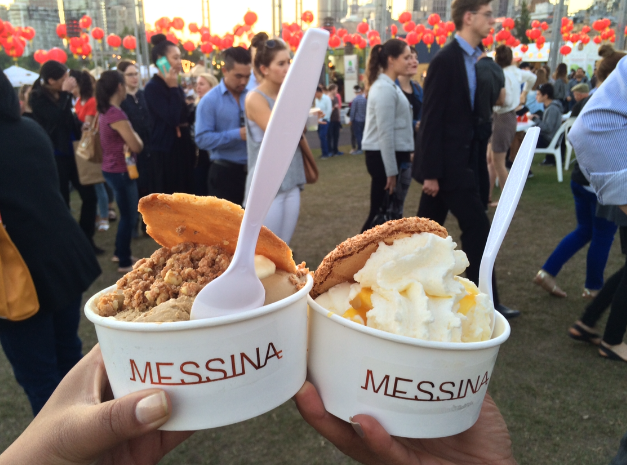 Gelato Messina created some really exciting flavour combinations. 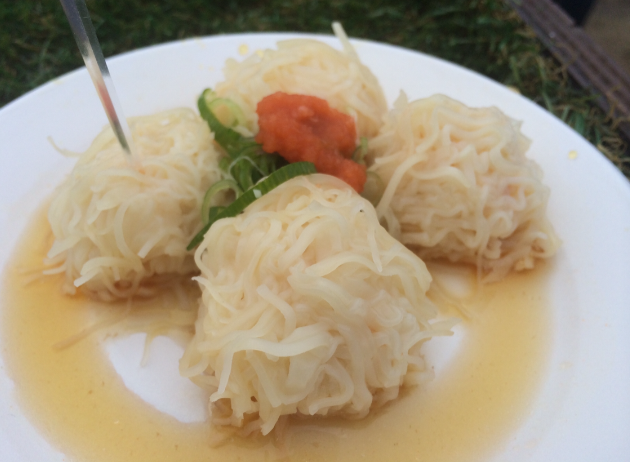 We tried the Phuc Khing Tasty and this dessert was exactly that. It was cinnamon scroll (like literally a piece of cinnamon scroll), coffee gelato, condensed milk panna cotta, walnut crunch and an Asian spiced cookie. It was amazing. It was really fun journeying through the different elements. We also tried Happy Taste Bud Time, which was just as delicious. Lychee sponge, mango puree, rambutan & coconut gelato, whipped salted coconut cream (omg yum!) and a cocnut macaron. It was amazing. I could have eaten a bowl of that whipped salted coconut cream. Exploring through the dessert and finding little surprises was fun. These two desserts were stand out and worth the wait in queue. After some time I mustered up the courage to eat again, I was very full by now but I wanted to try the Nori taco at Mr Miyagi. 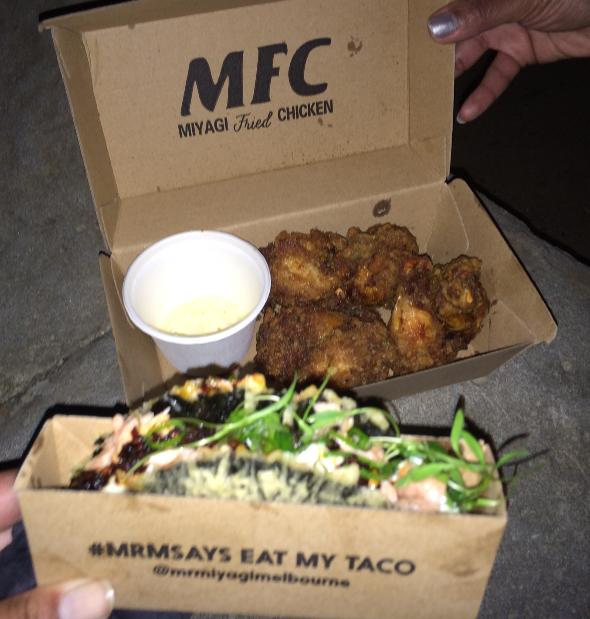 So I got a taco and while I was there I also got a cheeky six pack of MFC (Miyagi Fried Chicken). And I’m glad I did because that nori taco was pure genius and the fried chicken was yum too. The Nori taco is such an interesting creation and it was well executed. The taco was a sheet of nori battered and fried, then folded and filled with vinegar rice (like sushi rice), grilled salmon belly, spicy nappa cabbage, japanese mayo and chilli oil. It was so delicious! And it didn’t even fall apart. My issue with normal tacos is that they fall apart when you bite into them. Not with this one. The nori taco is flexible and easy to eat. It was fantastic. So creative. It’s a great event and it’s still on for another week. 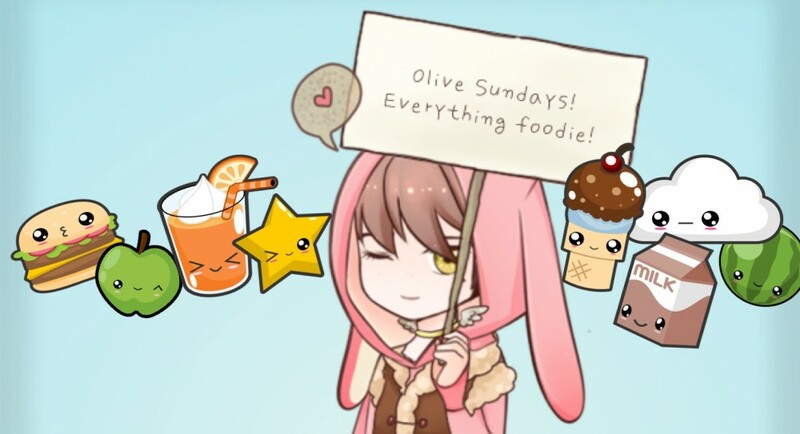 There are so many amazing food stalls in one place. 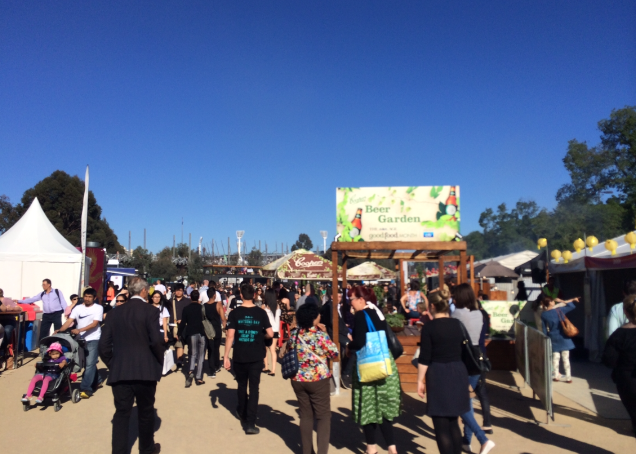 It’s really well organised and is definitely one of my favourite food festivals. I heart the Night Noodle Market! 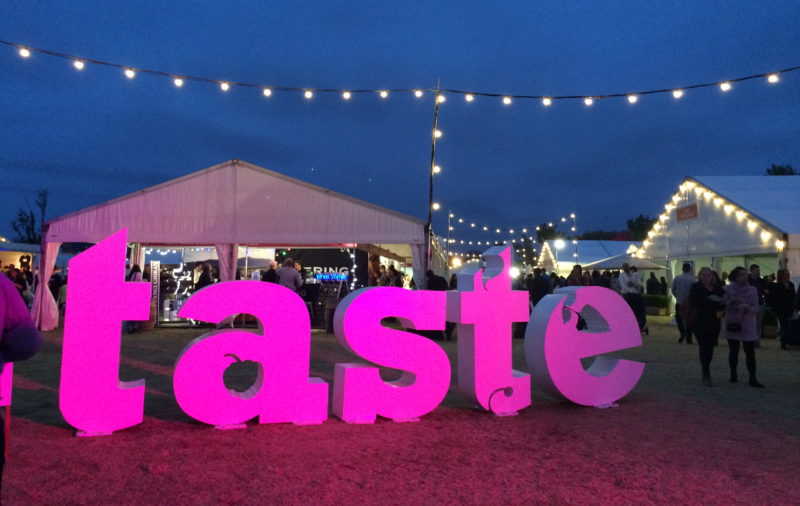 Taste of Melbourne is an event held at Albert Park where Melbourne restaurants come together to showcase their food. This allows you to try a variety of dishes and experience an assortment of Melbourne restaurants in one big eating bonanza. It’s sort of like going on a food contiki tour. You make a short visit to numerous restaurants and get a brief feel for each place. Later you can revisit the Restaurants of the stalls that you enjoyed most. 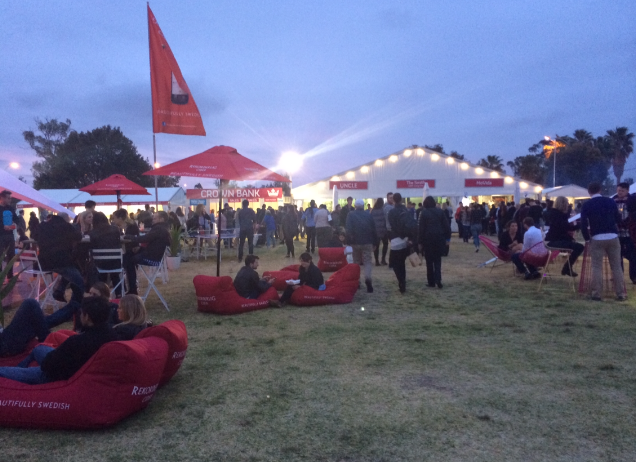 There were lots of seated areas and chill out lounges where you could just hang and grab a drink. Recorderlig had some big red bean bags which were comfy. There were lots to choose from but Gazi’s soft-shell crab souvlaki caught my eye. I’ve had a chicken souva, lamb, beef, pork souva but a soft shell crab souva? Nope, not until now. It was outta this world. Yum yum yum! . The soft shell crab was battered and deep-fried. 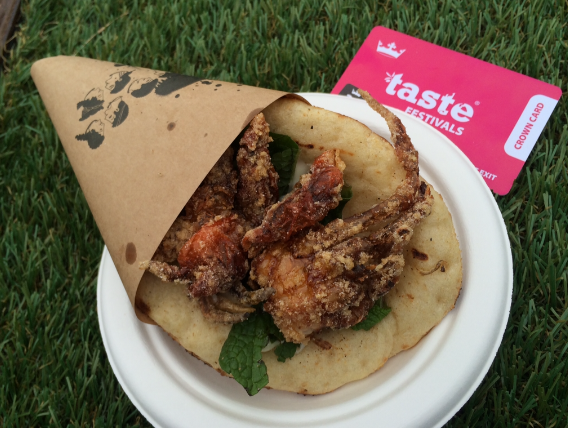 The crab was deliciously crunchy siting in a soft pita with honey, mayo, mint and coriander. Soft, crunchy, creamy, sweet, fresh…yum! One of my faves. 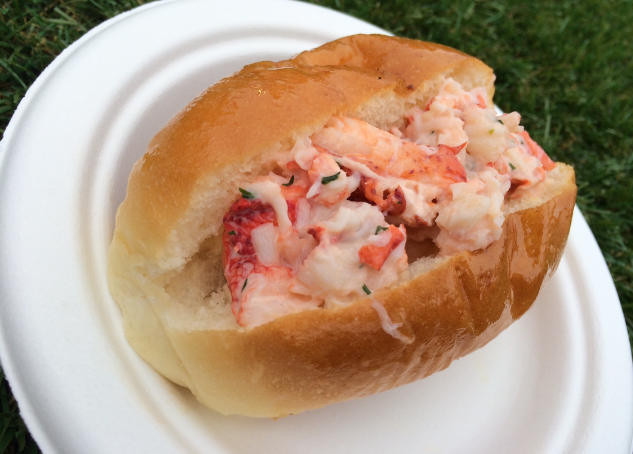 To continue the seafood high we wandered over to Mr Claws and tried the chunky buttermilk lobster roll. Oh YUM! Forget Santa Clause, Mr. Claws has the goods. There were big chunky pieces of lobster mixed in a buttermilk ranch sauce. The roll was soft but also toasty and super buttery like brioche. Can this be my favourite too? It was delish! They also had a miso wasabi and spicy version. Yum! We got a sneaky snack from Huxtable, which was a thinly sliced crouton w smoked Ora King salmon, capers, onion, lemon oil & spots of crème fraiche. It was delicious. Simple ingredients that go so well together. This little bite-sized toastie was superb. 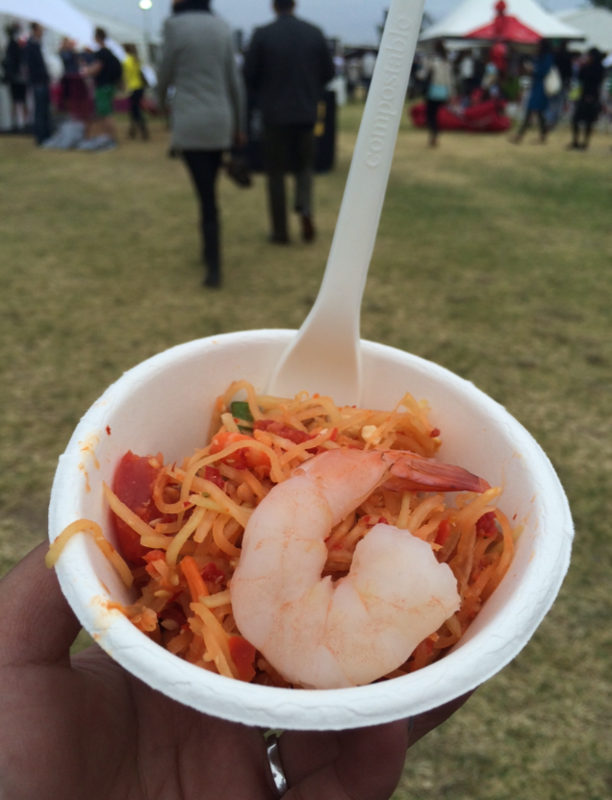 From the Lucy Lui stand we tried the Thai style king prawn salad w green papaya, lime & peanuts. I was surprised they didn’t mention it had chilli seeings that it was a prominent component of the dish. I like chilli so all good. The one prawn on top was kinda bland but the salad was fresh and spicy. There was a big charcoal BBQ at the Movida stall. We ordered the Pinchitos Morunos which was Flinders Island lamb marinated in Moorish spices & cooked over charcoal. 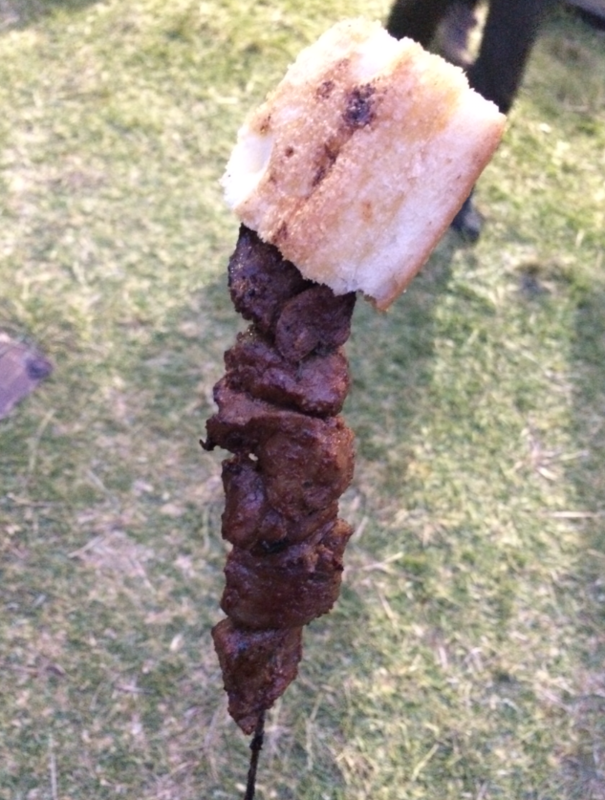 It was a gigantic lamb kebab with a big piece of crusty bread on top. The flavours were intense and the meat was juicy. I liked the chunk of bread on top, it was a cute touch because the marinade was the kind you would mop up with bread if it was served on a plate. It was delicious. We got the Chicken R’fissa Wrap from B’stilla which was tasty. 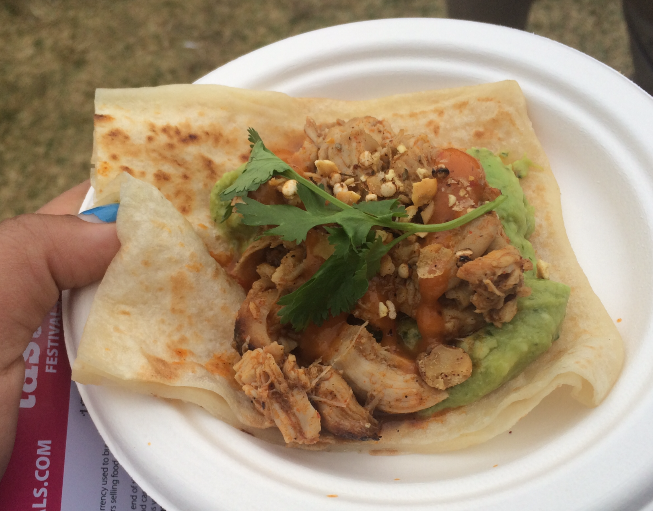 It was a square of roti with spiced avocado, shredded chicken and topped with a chilli apricot sauce. It was yum. From Sake restaurant & bar we tried the steamed prawn Shumai dumplings which didn’t look like your usual Shumai. The dumplings were wrapped in a noodle like pastry (oodles of noodles) and served with ponzo dipping sauce, spring onions & chilli. They were nice. 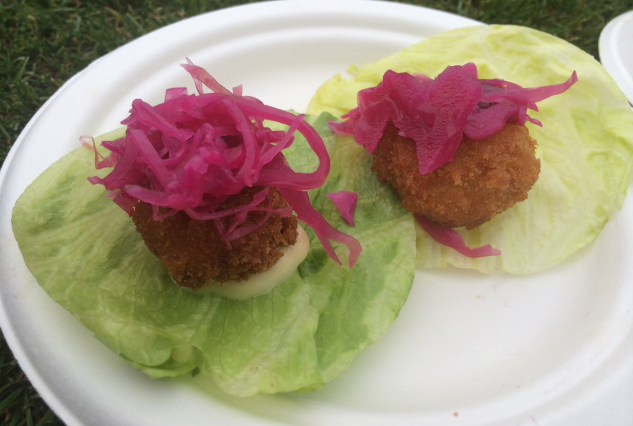 We also tried the Tonkatsu cups from Sake restaurant, which was panko fried pork belly bites served in lettuce cups with cabbage and mayo. They were good too. 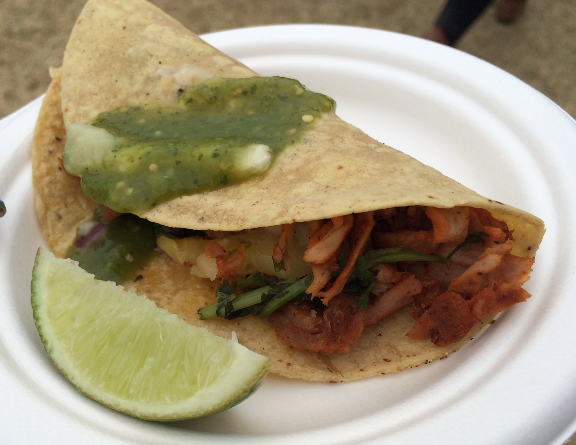 At Mamasita we tried the Taco Al Pastor, which was delicious. The taco tortilla was really soft and the Al Paster-style (spit-grilled) pork was amazing. I really like the flavour combo of pork, onion, pineapple & coriander. I was loving the pineapple it made it sweet and spicy yum! And there was also a side of green salsa to put on top. Yum! Okay now by this time my savoury tummy was full and it was time for desserts. The N2 Gelato Ferrero Reveal was like Ferrero rocher, the ice-cream. It was so fricken delicious. It was basically an ice-cream cup of nostalgia. It reminded me of Nutella, choc-tops, ice-magic, coco pops and Ferrero rochers. Good times. 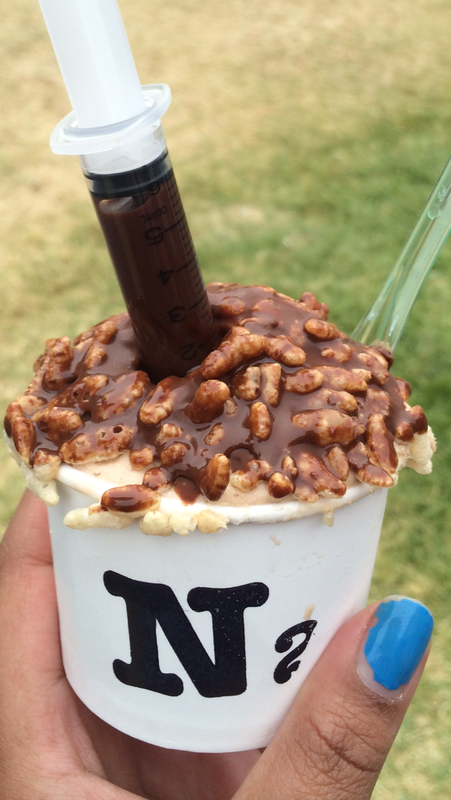 The nutella ice-cream had rice bubbles through it which tasted like coco pops. The rice bubbles replicated the texture of the Ferrero wafer sphere. 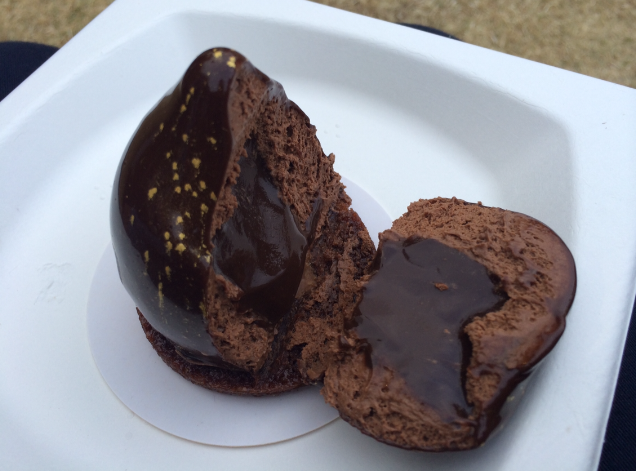 The chocolate ganache was like a choc top and went hard like ice-magic. 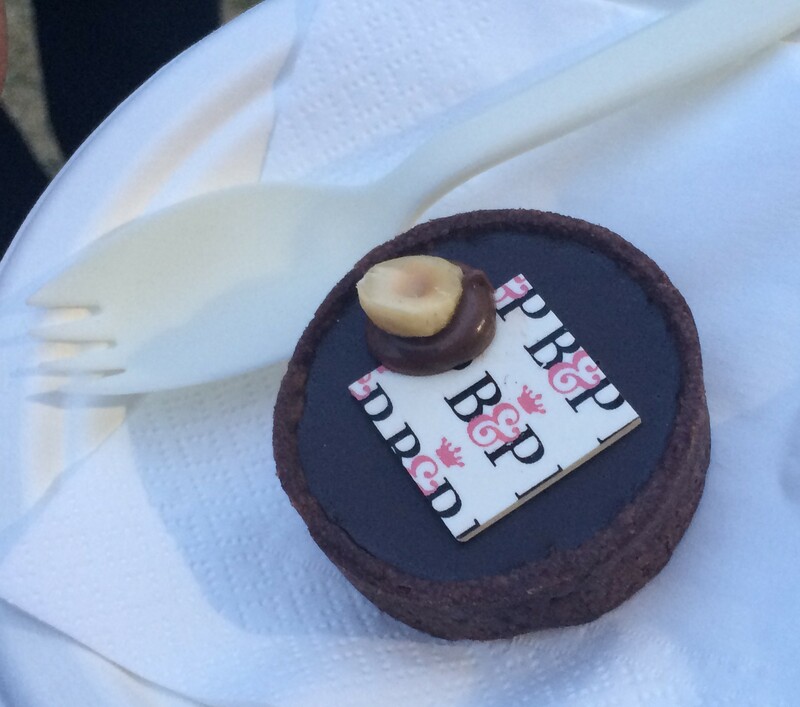 And then all of that was injected with a syringe full of chocolate ganache. One marvelous creation. 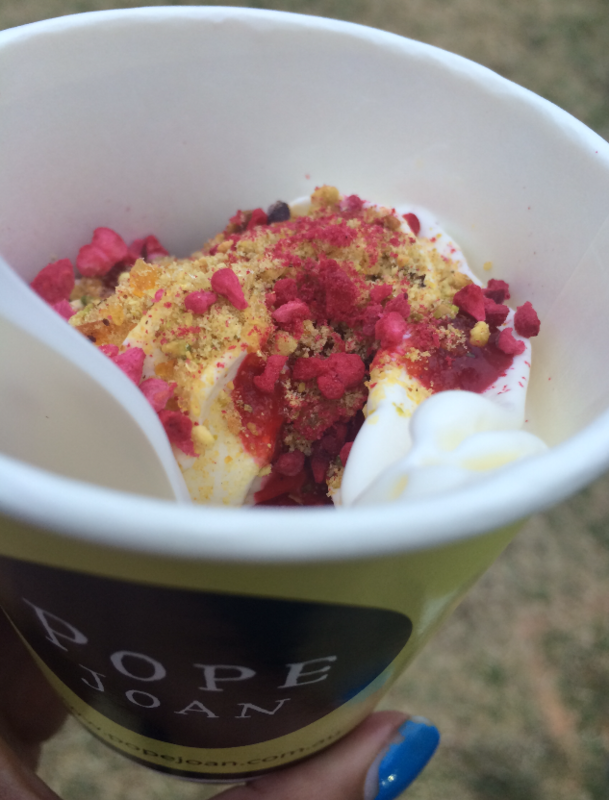 We tried Pope Joan’s Mr Wilkie, which was a smoked yoghurt soft-serve ice cream. The yoghurt had a noticeable smokey flavour which was interesting and then it was paired with a sweet raspberry coulis, some freeze dried raspberries and a pistachio crumb. It was a sensation of flavours and textures. It was voted No. 1 of the festival and rightly so. It had a complex array of flavours that made this dish much more than just a soft-serve. Loved it!! From Dish’d we tried a black pearl, which was a tear drop shaped dark chocolate mousse cake with gooey caramel chocolate sauce in the center sitting on a chocolate almond base. It was one fabulous chocolate expedition. Chocolate lovers ahoy! And finally by the time was got around to Burch & Purchese we were full to the brim. But we managed to squish in a choc, caramel and hazelnut tart which was delish. The sweet caramel and chocolate tones with an evident pinch of salt makes this tart a keeper. 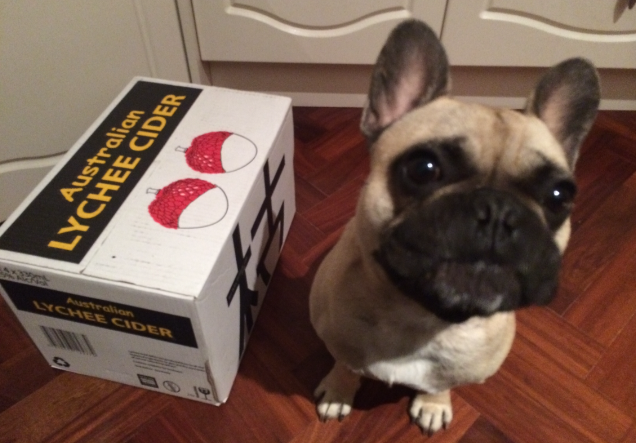 Also we loved the Lychee Gold cider so much that we decided to take home a slab for later. 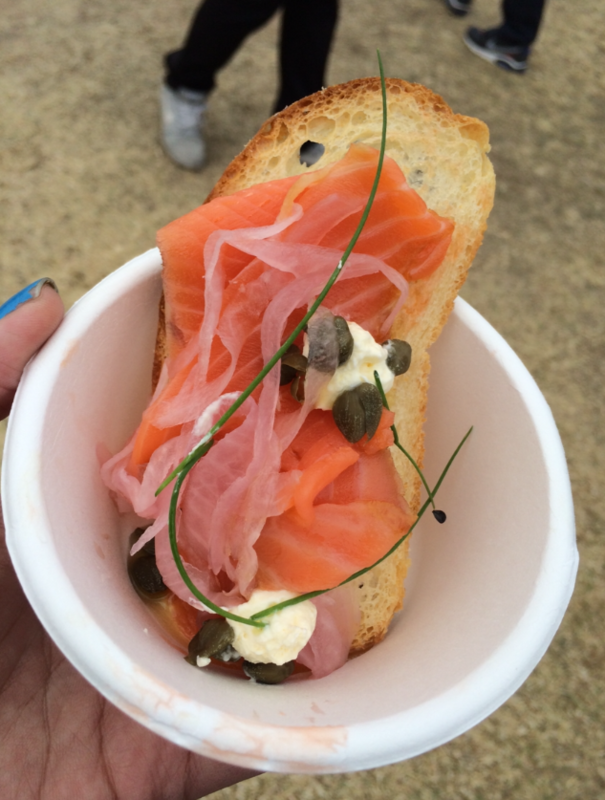 I heart Taste of Melbourne 2014!